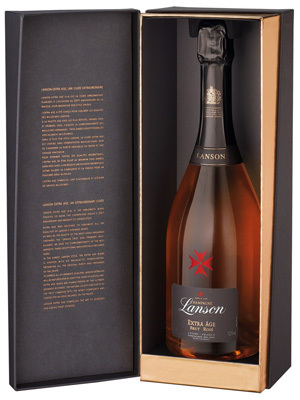 Lanson Extra Age (X.A) Rosé is the result of over fifty years’ pioneering expertise in the creation of rosé champagne. This delicate, fresh blend combines Chardonnay (35%) and Pinot Noir (65%) from selected “grand cru” vineyards (Avize, Chouilly, Cramant, Oger, Le Mesnil-sur-Oger, Verzenay, Bouzy) and a marriage of three great Lanson vintages: 2002, 2004 and 2005. Blended and then aged at least five years in cellars. Lanson Extra Age Rose offers a salmon-pink, coppery robe enlivened by a myriad of fine bubbles. The fragrances of red berries and sweetmeats are dominated by the aroma of strawberry jam. The palate reveals the deliciously sour notes of wild strawberry, redcurrants and red-fleshed peaches. Lanson Extra Age Rose Cuvee will be the ideal champagne to accompany lamb and desserts made with fresh red fruits. Extra Age is aged for a minimum of 5 years. For this Grande Cuvée, Lanson has combined two essential elements of its expertise: a blend of Grand Crus and the marriage of three exceptional vintages. The vintages 2002, 2004 and 2005, and the Crus have been carefully selected to complement one another perfectly.